Credit: Wikimedia Commons photo by Andrew Bossi, CC BY-SA 2.5. Sprouted corn tortillas are the key - but where to find them? I commonly make homemade tortilla chips by frying corn tortillas on my stovetop, then adding a little sea salt, and I typically eat them with homemade guacamole made from avocados grown in my backyard. I do believe I’ve discovered how to make the very best tortilla chips possible. Rather than making them out of the typical corn tortillas that can be found in any grocery store, I use some more expensive tortillas made from sprouted corn. Fittingly, I found them at a local grocery store here in Southern California called Sprouts. When I purchased them I didn’t know how different they would be from regular corn tortillas. The higher price caused me to at least want to find out. I’m here to declare they’re the best thing on Earth. Finding corn tortillas made from sprouted corn may be difficult. Below I give advice for locating some, although it may not be possible in some locations. Regular corn tortillas will of course work for this recipe, although if you can get sprouted ones, I highly recommend it. At the end of this recipe article, I give some information about sprouted grains – what they are, why they are beneficial, and some info about grains and nutrition. The website of the company that makes sprouted corn tortillas, Food for Life, has a store locator. Using this, you can see if there’s a store near you. If there is, give the store a visit or a call and ask if they carry the sprouted corn tortillas. If there’s not a store near you that carries these tortillas, you can order them online. The products below contain affiliate links that generate the author a small commission on purchases made through the links. These are the same ones I get at my local Sprouts grocery store. Credit: Wikimedia Commons photo by Sander van der Wel, CC BY-SA 2.0. I fry my tortilla chips in any of several things – olive oil (either extra virgin or light/refined), refined coconut oil, lard, or bacon fat. My recommendation is to avoid industrial seed and vegetable oils, which are unhealthy and inflammatory. 1. I typically use three to four corn tortillas per person. 2. Each tortilla is cut with a pizza cutter into four pieces. Several can be cut through at a time. It's also easy to just put tortillas down without cutting them up, if you don't mind eating them whole. 3. I use a cast iron pan that about eight inches (20 cm) across. With each of the oils or fats listed above, I put just enough to cover the bottom of the pan and then a little extra, so it’s probably no more than one-eighth inch (one-third centimeter) deep. I don’t add the fat until the pan is fully hot, just before putting down the first chips to fry up. 4. I put the fire on the stove a little hotter than medium. Your particular stove may require a different setting, and so some experimentation may be necessary. 5. Next to the stove I place a large plate or platter with a paper towel covering, and I place finished chips on it. When it’s covered I salt them all and put them in a bowl for eating. Sometimes I cover the plate several times as I’m cooking them all, clearing them and handing them out periodically. 6. The chips are done when they begin to brown on the edges. No need to flip them over while cooking. Some experimentation may be necessary to figure out exactly how long to cook them, to have the desired level of crispness. 7. I use regular small kitchen tongs to put them in, and to take them out when done. 8. When the fat level in the pan gets a little low, I add a little more. Be careful with lard and bacon fat, which sometimes will spatter and sputter. The others listed above do this much less in my experience. Once you get accustomed to making tortilla chips at home, you’ll be reluctant to buy them already made in a bag from the store. Homemade is just way better. 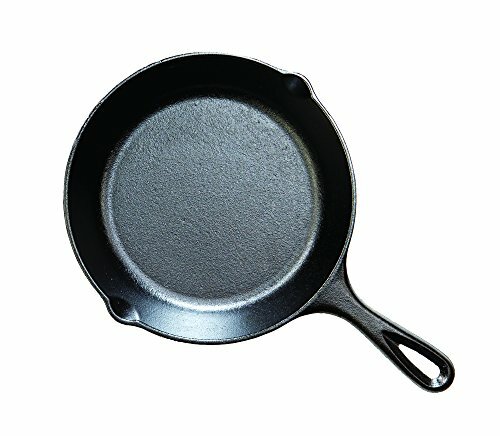 Cast iron and stainless steel are the best options for stovetop cooking, unless you can afford expensive ceramic cookware. This pan is what I use. Credit: Wikimedia Commons photo by Dip Country, CC BY-SA 3.0. As stated in the introduction, I have an avocado tree in my backyard. It yields hundreds of avocados every year, far more than we can eat. Typically the neighborhood raccoons steal some. We also give dozens away to friends, family members, and neighbors. When you get accustomed to making homemade guacamole, it becomes quick and only takes a few minutes. I slice the avocado all the way around the large seed lengthwise, and open it into two halves. Avocados should typically be somewhat soft when they’re going to be used, giving some when pressed with a finger or thumb. Different types of avocados actually ripen at different point. What I just described for testing their ripeness applies to the common storebought variety, although the ones from my backyard have to be considerably softer before they’re ripe enough to use. I gouge out the large seed, and then scoop out the delicious light green with a spoon into a bowl. Our family (myself, my wife, and three of our four kids who eat guacamole) typically eats two large avocados at once. Garlic powder (a dusting over the entire avocado). Finely chopped up onion (green onion, sweet onion, or any type except the overpoweringly pungent brown onions – if it’s brown onion, I’ll use about half the amount as the others). My wife complains I don’t measure anything when I cook, but I use one good slice that’s two to three inches (5 to 7.5 cm) across, and less than ¼ inch (0.6 cm) thick. That’s my amount for two avocados. Cilantro – I sprinkle some on if I have it, either fresh from the store or sometimes I’ve bought a jar with freeze-dried cilantro from Target. I may add some mild salsa too (mild for the kids – I like hot, but don’t want family members to pass away). For two avocados, I would add about two or three tablespoons. All of this can certainly be adjusted to suit personal tastes, and remember to stir it all up really well! For those wondering: What is a sprouted grain? Credit: Wikipedia photo by Bluemoose, CC BY-SA 3.0. This is something I learned about when studying nutrition during 2013. Grains are best absorbed, and have the most nutrients available to our bodies, when they are whole grains – although also they also should be prepared properly with sprouting, soaking, or fermentation. Preparation methods vary with different grains, such as corn, white, rice, oats, quinoa, etc – and this is how grains were eaten for centuries, although recently in our modern culture we have become lazy and have often eaten grains that are refined and not prepared in this manner. Grains in this way become considerably less healthy, and possibly even harmful to health. In our modern culture, people tend to think they have no time for anything (such as being healthy), and so grains are typically consumed which haven’t been properly prepared, and it can cause digestive problems and inflammatory reactions for some. White rice and other grains which have had the outer fibrous layer removed don’t need this treatment, although white flour made from wheat is a lot like sugar, and is inflammatory and unhealthy. My recommendation is to search for information about this topic. This is not mainstream knowledge. It takes some time to find good information and to get accustomed to doing the various preparation methods, although like anything, it gets easier with practice. In my home, we sprout quinoa and brown rice before cooking and eating it, and my wife makes homemade sourdough bread from a combination of sprouted spelt and unbleached white flours. 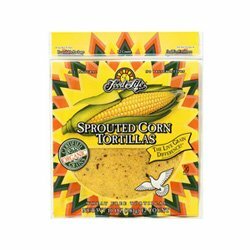 We also eat the awesome sprouted corn tortillas I’ve been discussing, and my favorite cereal is corn flakes made with sprouted corn. As anyone reading this can probably tell, I take health and nutrition extremely seriously. I’ve overcome some serious health problems largely through the changes that I made to my diet, and I highly recommend that everyone make nutrition a high priority. Yum yum. I love to cook with a cast iron pan (and cilantro is my favourite herb). Makes me salivate. I'd definitely love this.